Are you already missing Xmas? It’s always Xmas in Knight’s Fable! Have you ever dreamed of Santa’s arrival, carrying loads of gifts while mounting his docile Reindeer? Well, in Knight’s Fable,- on, the devs invite this Reindeer into our mount family and every player has a fair opportunity to get it. It says that Santa has 9 Reindeers: Donner, Cupid, Comet, Vixen, Prancer, Dancer, Dasher, Blitzen and the leader Rudolph. All the other reindeers and his parents would often tease Rudolph for having a red nose which he was really shy about. Once, on Christmas Eve, Santa couldn’t find his way through the smog. But he soon noticed Rudolph’s red nose was the only thing shining and used it has a light to guide him through the smog and successfully deliver all the gifts. Rudolph, the red-nosed reindeer has since become the leader of Santa’s reindeer squad. Even though this mount doesn’t have a red nose in Knight’s Fable, it still is Rudolph’s offspring and it excels at leadership and has powerful skills. Just like Santa, we decorate our reindeer with beautiful shiny bells and fancy reins. While riding it, you can hear the jingling off the bells. Ride the Jingle Reindeer and it will bring you good luck. Visit http://knight.gtarcade.com/ for more details about Knights Fable. 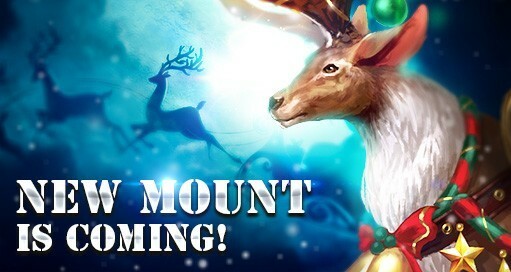 he cute NTales: Child of Destiny reveals a new event, entitled NTales Winter Wonderland. A white Christmas overwhelms the game!